Although I applaud the resurrection of British craft, it is the quality of the work itself - rather than where it takes place - that I’ve always thought should be the consumer’s priority. So while it was lovely to know Blackhorse Lane Ateliers was producing jeans in London, it wasn’t until the difference in craft was pointed out to me that I really became interested. BLA focuses on improving the finishing and functionality of its jeans in every way possible, rather than copying copying old styles for their own sake. So in the image below, for instance, you can see a pair of high-end Japanese jeans (Momotaro, right) compared with BLA (left). Note how clean the Blackhorse Lane fly is, largely as result of replacing the big yellow overlock stitches of the Momotaro with a neater felled stitch. It wouldn’t be too much to call this a more tailored, or sartorial finish. And functionality is just as important. In that same image above, note how the chain stitching on the waistband (bottom right) runs an inch down the fly, then jags diagonally back in, ending on the copper rivet. This method of attaching a waistband, with chain stitching that runs all the way around the waist, integrates the leather patch on the back, and ends on the rivet, is stronger. It’s used by both of these jeans, but by no means all jeans. BLA also tend to use heavier pocket bags, line the bottoms of their rear pockets, and tack their belt loops to seams rather than the body of the jean. Then some refinements improve finish and functionality. The best example here is the one-piece fly (above), which is very rare. 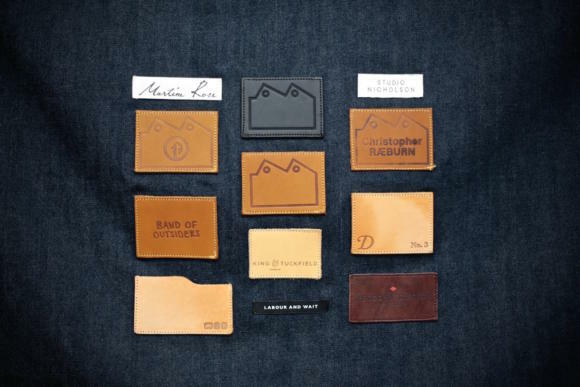 This comparison is between Levi’s 501s (bottom) and BLA on the top. You can see how the fly of the BLA jean is made of a single strip, while the Levi’s are two pieces stitched together, which creates a weak point. It’s both neater and stronger. Although I’ve bought many pairs of jeans over the years - British, American, Japanese - my focus has always been different denims or different fits. 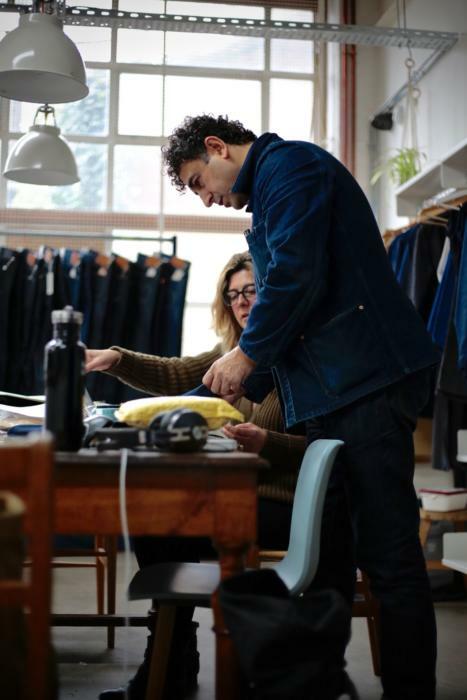 (It was the drive to find a perfect fit that led me to use the Levi’s bespoke service - which I still use and recommend). But I’ve never seen much of an argument for different levels of make in a jean. 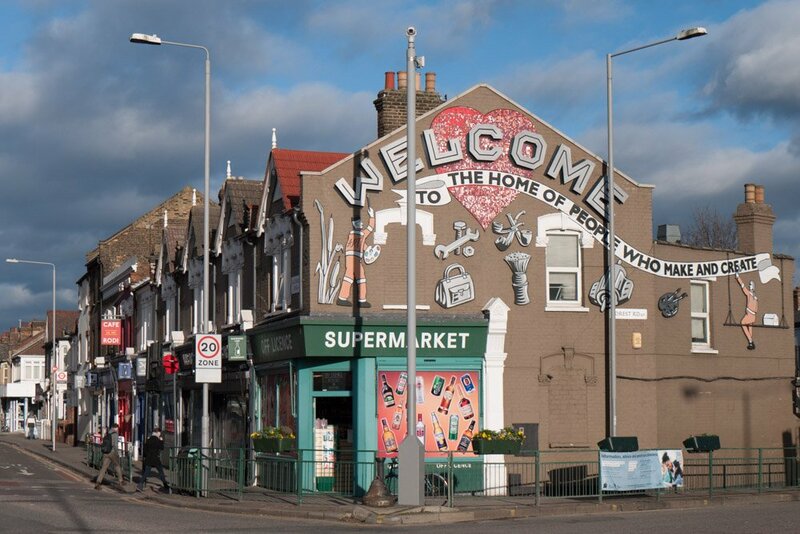 Blackhorse Lane changes that - largely by rethinking the assumptions of the industry. 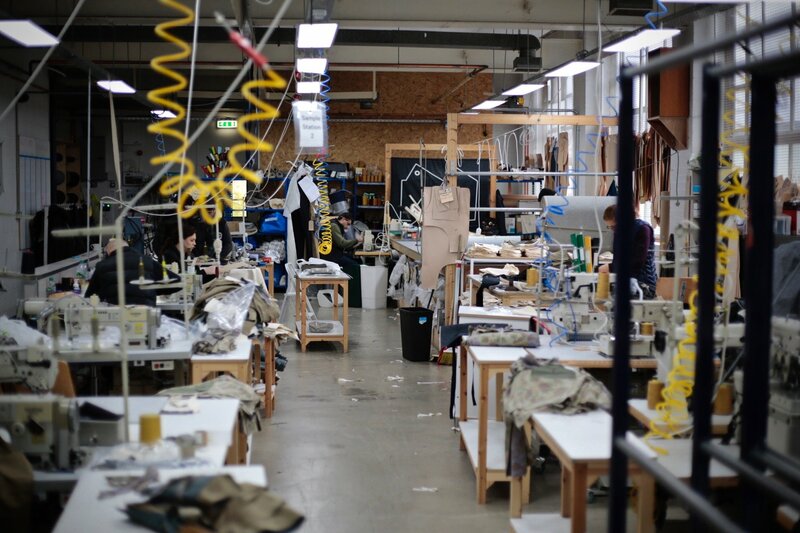 Global high-end denim is largely driven by a desire for heritage and authenticity. It’s what launched the Japanese industry and what still drives many denim obsessives. But in the same way I’d question location of manufacture as a factor in rating a product, I’d also question old methods of working. In many cases they were better, at least for functionality. But not always. Blackhorse Lane began their journey just over two years ago, by going to the legendary Rudy Budhdeo of Son of Stag and asking for his top 12 pairs of jeans. They analysed all of them, noted the things they all did better or worse, and put together the best composite jean. And then they started innovating on top. 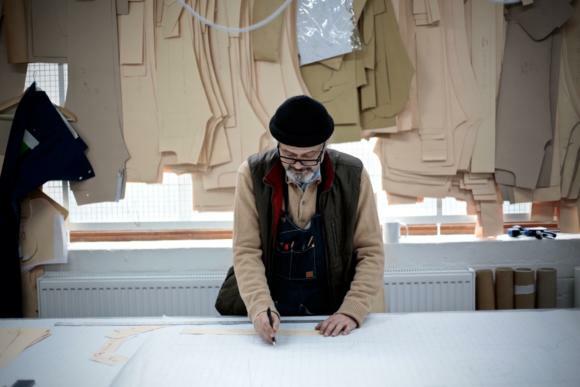 The factory’s owner, Bilgehan ‘Han’ Ates (pictured above), had been running garment manufacturing in London for 30 years, on and off, but largely for tailored garments rather than workwear. So he and his workers naturally tidied up a lot of the traditional ways of making jeans - such as the overlock stitching. And some innovations came from original research. The one-piece fly, for example, was in a 1896 pattern for jeans that Han found. The other reason I hadn’t been sure about covering Blackhorse Lane before was that the jeans I had tried - the Drake’s model and the ones The Rake had at our pop-up - didn’t fit me that well. However, I tried the full range at the factory, and the NW1 is actually a good fit (high enough in the rise, big enough in the leg). Not bespoke, but very good. I’m currently gradually beating the 18oz NW1 into submission. I should also say a word about the value for money at Blackhorse Lane. Although my jeans were £290, which is a lot, models like the E5 start at £155. If you’re a first-time customer, BLA also offers 17% off your first purchase if you sign up to the newsletter. And they also offer free repairs. Which is amazing, given the whole beauty of jeans is wearing the cr*p out of them and then patching or stitching them back up again. They might never sell you a second pair. Below are some on the pile to be repaired. Much as I play down the importance of location, Blackhorse Lane is a lovely place and definitely worth a visit. There are weaving studios at the back, making and dying workshops, and ‘Dine and Denim’ evenings that apparently do some wonderful food. It’s also, of course, the best way to see all the fits and other products (accessories, coats and some shirts coming soon). And that’s a much better reason for focusing on location. 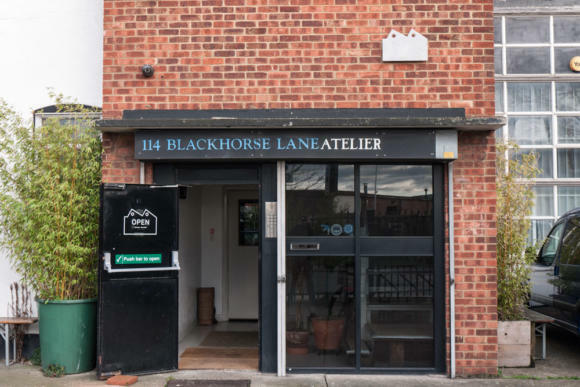 You can follow the discussion on Blackhorse Lane – innovative, sartorial jeans by entering your email address in the box below. You will then receive an email every time a new comment is added. These will also contain a link to a page where you can stop the alerts, and remove all of your related data from the site. I’m surprised the Drake’s model didn’t fit you well. When I asked BlackhorseLane about them, they said the Drake’s model is based on the NW1 that you bought. To be honest I can’t remember exactly, but they were relatively minor differences. I can always ask Drake’s. Paddy – not 100% sure but I think the Drake’s model was based off the NW3. Generally – I feel it is necessary to say how much I love what these guys are doing and how great the product and service is. Mine are about 6 months old now, just about to have their first wash – and wearing well. Although I would echo the difficulties of the fit, I got the E8 – supposedly the slim tapered fit – but it fits much more like the photo’s of the Drake’s or NW3 ones (the NW1s didn’t actually exist when I got mine). I also took a couple of waist sizes down from my usual, and if anything I’m still hoping they shrink a little in the wash. Definitely worth trying them on in the factory shop if you can get out there, I wouldn’t buy online. H, the three fits are quite different. – The E8 has a strong taper throughout the entire leg, and a slim-ish hip. – The NW3 is pretty much a straight leg, with a slim hip. – The NW1 has a roomy hip, and tapers only to the knee. From there it’s straight. H, we forgot to mention. 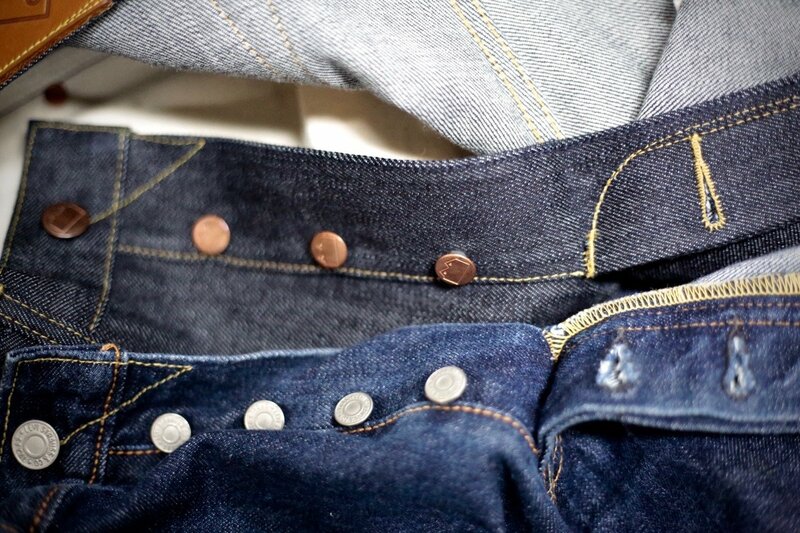 Our denims are sanforized (pre-shrunk) which means that all shrinkage in the width is already gone. They will however shrink 3% (roughly 1″) in the length upon the first wash.
Paddy, the Drake’s No. 3 is inspired by our NW3. The NW1 is a new fit we’ve just developed. Thanks for replying. I really hope I didn’t cause any offence at all, they are my favourite jeans by quite a margin – so its nothing to do with the product. I nominated you guys for the customer experience of the year at the PS awards and I think that speaks to how pleased I am with them. Rather, just trying to help others with sizing, as they do seem to run a little big and my E8’s tend to look in practice more like the NW3’s do in the photos – which is the look I was going for and I feel have achieved. This is of course probably in part to do with my own body shape, with a relatively big waist compared to a relatively skinny leg. Absolutely no offense taken! My American-ness can sometimes come across in my commentary. Thanks for the nomination as well. You’re definitely right that our jeans are a bit on the bigger size! Thanks for clarifying but can you briefly describe what the fit difference between the Drake’s one and the NW3? And also what denim and oz is the Drakes denim? Dolce&Gabbana is the best in terms of fit. You should try simon. I had a few pairs of D&Gs in the past, and their jeans fitted considerably slimmer than the brands usually covered here. So young and slim guys may indeed find them a better fit OTR, although as Simon said, everything except rise can be adjusted quite readily. Couldn’t agree more, love my D&G jeans, such a high quality product being made in Italy. Simon why do you think someone’s taste is poor if they shop with D&G?? Whilst we’re on denim, would you still recommend Albam’s jeans? They’re obviously at a different price point (and I presume therefore quality/design level) to what is being discussed here, but in my (very limited) opinion should still represent excellent value. Simon, how do they compare with The Armoury’s jeans? Unless you mean in terms of fit? Try hiut denim. Great fit and quality. Also backed up by fantastic customer service. I’ve several pairs. Very happy with them. They also do limited runs of non-standard denim. Only sized by waist…good luck if you aren’t the same height as the model! Great – but I’m 5’4″, and the models for jeans typically seem to be ~6′ and have jeans often rolled / cuffed . Can they really be shortened by that much without destroying the taper? Dom, if you find a jean that’s tapered mostly in the thigh, but not in the calf, you should be able to taper while retaining the fit. Our NW1 and N16 are both examples of that type of cut as they only taper in the thigh. Our other jeans wouldn’t work as well, but will still roughly keep the same look when tapered. I was wondering for some time whether I should buy a Blackhorse Lane jean and your article convinced me. I have a “stylish question”. Namely, would you wear the jean you bought with black shoes? Interesting – manufacturing location does matter to me. I prefer to by British. That said, are they colour fast ? I know very niche, and you aren’t a biker, but any idea of where on earth to find Kevlar jeans that don’t look like *expletive expletive expletive*? No worries, thanks. Would be good to have a bit of niche sporting wear. I know you had done running and cycling but might be interesting to see about tennis, motorbikes, ski, shooting etc. Lots of sartorial, equipment heavy sports! Try looking through Heddels news archives there are some covered there. Or if you want advice look on the Iron Heart forum. Simon – What are your thoughts on the trade-offs between buying raw versus colorfast denim? I recognize that jean purists may scoff at this question, as presumably they’d deem the benefits of raw denim jeans self evident–they’re long-lasting, hard-wearing, and fade uniquely. But it’s not clear to me that the the amount of treatment and wear required to realize these benefits is necessarily worth it. Sure, I was new to raw denim, and I’m now aware that there are ways to mitigate the bleeding dye at least. But this still seems like a lot of additional effort and treatment to put into jeans that, at the mid- to high end, are certainly not inexpensive. The calculus would be different if I regularly wore jeans as workwear, but as is likely the case with many PS readers, I don’t wear jeans most days. And if you’re mostly only wearing jeans on weekends, the amount of time required to actually break them in seems long compared to the relative enjoyment one might experience more easily from a smart pair of colorfast denim jeans. Apart from my issue with fit–the PS answer to that of course would be to just go bespoke–is raw denim really worth the trouble? I’m interested in whether you’ve encountered any of these issues with raw denim. I know what you mean completely. The 18oz ones I’m beating in now from BLA are certainly tough going, and I’m doing it in the evenings, weekends and the occasional week day. However, having done it before a few times, it seems weird to me now to not start with denim like this. I think it’s because I love, personally, how great things age, and the idea of having jeans that don’t age and wear in (or worse, have fading put in for me artificially) just seems odd. Like wearing someone else’s clothes. In the end, I’d say it’s very personal though, and it’s not worth worrying about if you can’t be bothered to do it. Fit and line is the most important thing. Great choice of weight as well there Simon – not really touched on in the article but another interesting topic. Paul, if you search for denim that uses “reactive dye” you’ll find jeans that don’t fade. A few brands do make them (ex: Japan Blue Jeans), but we don’t do at this time. We’re obsessed with indigo ourselves due to the patina that develops, much like breaking in a great pair of boots. Over time, you develop a personal fingerprint on the jeans that ties back to personal stories made in them. I agree with you about the work required with raw denim. I bought some Uniqlo selvedge jeans, which are very reasonably priced and a good way try raw denim at a low starting cost. It’s a tough sell recommending an off-the-rack denim line as there’s no one perfect fit and fit is essentially all that matters. So many lines do good raw fabric now and the durability distinctions you point out aren’t really essential (in my experience with most decent denim, the fabric wears through well before stitching fails). And can we stop it with the button fly? Zippers were invented for a good reason; they’re not just a symptom of poor make. Thanks Ben. I agree, fit is by far the most important thing and durability is not going to make much difference. To be honest, I like buttons on denim but pretty much never get them on tailoring. I find them much easier to do up and undo on tougher cloths. I remember posting disagreeing with your statement that their wasn’t much to the make of a jean. Nice to see you’ve found something that convinces you otherwise. 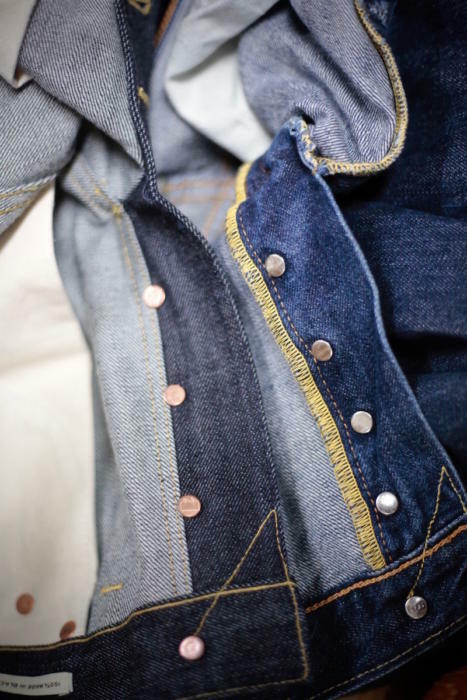 Some of the Custom Denim makers have some pretty ace options regarding improvement to finishing. Thanks Jordan – and good point. I’d still say there’s nowhere near the same difference with denim manufacture as there is with tailoring, though. Also that most of the things listed here for BLA are about aesthetics or strength points that are to be admired, but unlikely to be put to the test by most of us. Companion Denim from Spain (http://www.companiondenim.com) has the most options listed on their website under custom jeans. They mostly do single needle construction. They have a lot of different options for fly, waistband and belt loop construction / detailing, and a fishtail back. They do have a bespoke option as well. The sewing is mostly single needle, as I don’t think they have a double chainstitch or felling machine. I haven’t purchased a pair of jeans from them yet due to the falling AUD/EUR exchange rate, but I would like to in the future. Ben Viapiana (http://www.viapiana.ca/) is another one. Where Companion charge extra for most changes to construction, pretty much everything you can think of is included in Ben’s base price. His website doesn’t have the options that Companion does but you can ask for whatever you like in the additional comments and he will try and accommodate you. Ben has a lot more sewing machines than Companion does so there are a lot more options in regards to how something is sewn. Ben has a few signature thread colours that he will use for the inseam and belt loop underside unless you specifically ask for something different. i’m an australian reader with strong legs who has historically struggled to find jeans that fit. i have had successes in the past but many of the wider leg varieties that other brands have manufactured over the years have been replaced with slimmer leg models. enter BHL. i have 2 x pairs of their jeans, both purchased in 2017 that are a perfect fit. the finishing and fabrics are great and BHL’s advice in relation to taking measurements made the process of selecting the style and size a doddle. i also found BHL a pleasure to deal with. i will certainly be a repeat customer & would readily recommend their jeans to your other readers. Thanks for the kind words TJ! Thank you for a most timely post. I have been thinking about getting a pair of Blackhorse Lane for som time. However, I am not often in London and evaluating fit by looking at pictures is difficult at best. Being an ex skier I have a similar challenge as you with larger thighs and calves. I find that jeans need to have a slight taper otherwise the room need on top, just leaves too much cloth at the bottom. Just makes you look fat and not terribly smart. I’ve been thinking that I need the E5 rather than the NW1. Did you try the E5? Also, since Blackhorse Lane sizes run large, did you size down 1,2 or 3 sizes? I did look at the E5, but it didn’t have enough rise in the back for me. I don’t mind the lack of taper. I got the 31 inch waist, which is probably one down on what I’d normally have, yes. I was relatively excited when I saw your post on Instagram visiting this this place as I have been following them for a while. I’ve been contemplating a pair to complement my Hiut ones. I was interested to see how the two compare. I find I wear jeans a fair bit more theses days so would like to increase my options. I am veering towards the NW3 as it seems to be the more formal offering. I’m really happy BLA gets a bit more “web focus” with your article Simon. It took a bit of time and tryings, but BLA provided me one if not the best pair of jeans i’ve ever worn. Being myself in the cloth industry i also adhere 100% to their philosophy of buying less but (way) better, and trying to repair a garment everytime it’s possible. Kudos to David, his outstanding customer service and his will to always improve the product/service. Thanks for the kind words Kevin! Simon…do any of the features you have described make the BLA jeans any more comfortable/fit better than comparable non-bespoke brands? I love Japanese denim and spend far too much money in son of a stag. I thought this was an interesting read as I’ve been curious about Blackhorse Lane. But I’m not sure the detailing you highlight qualifies these jeans as more sartorial than, say, an Ivy fit pair of jeans that look great with loafers or Warehouse’s ecru denim that border on chinos. Surely sartorial would lie far more in the cut – high rise so shirt doesn’t show too much when wearing with a blazer, or a reasonable taper so they don’t look too wide when wearing smarter, sleaker shoes. Anyway still a good read and miles ahead of most writing about clothes, casual or formal, that I come across. Interested to know how these jeans fade but perhaps that’s straying too far from your core remit. Hey. Not at all, I’ll happily cover that. Often do similar things under ‘Great things age’ posts for example. I have been seeing Blackhorse Lane in the The Rake several times, and this review has certainly been very insightful. Have you had any experience with Cifonelli or Jacob Cohen jeans and how they compare with Blackhorse Lane? Wonder how hard the black denim would be to break in! Any comments BHL? 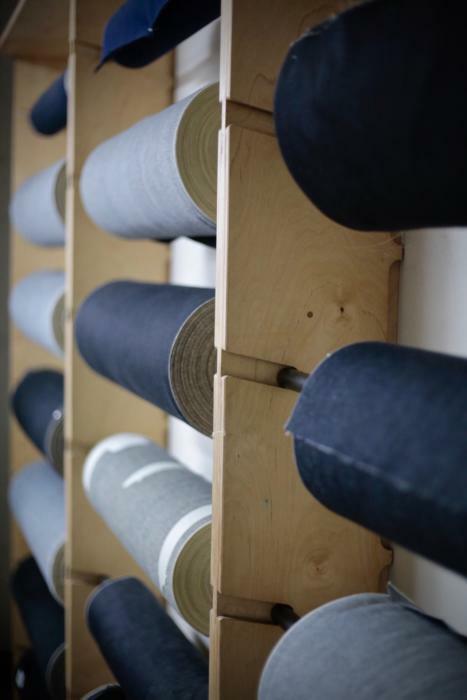 Hi Joe, our black denim breaks in quite slowly, as sulphur dye takes longer to wear away than indigo dye. Over time you may see a bit of grey, and a bit of the denim’s texture (slubbiness) coming through. Since both warp and weft threads are dyed black, it begins very dark. While wearing those jeans with the button fly made even more difficult to unbutton with the stiff denim, you better hope the need to use the loo doesn’t arise. It’s actually quicker I find… You can just tear buttons like that open. By way of further update, a design challenge; the gap between the two belt loops at the front is quite narrow. I have a beautiful Bakers of Colyton leather belt which has two fixed keepers which I cannot wear with the jeans because the narrow gap means the buckle is pushed to one side. Is it possible to increase the gap between the belt loops? – We spoke with the customer via email about the failed pocket. The pocket is the secret “stash pocket” sewn inside the bottom of the front pocket, rather than denim coin pocket at the top of the front pocket. 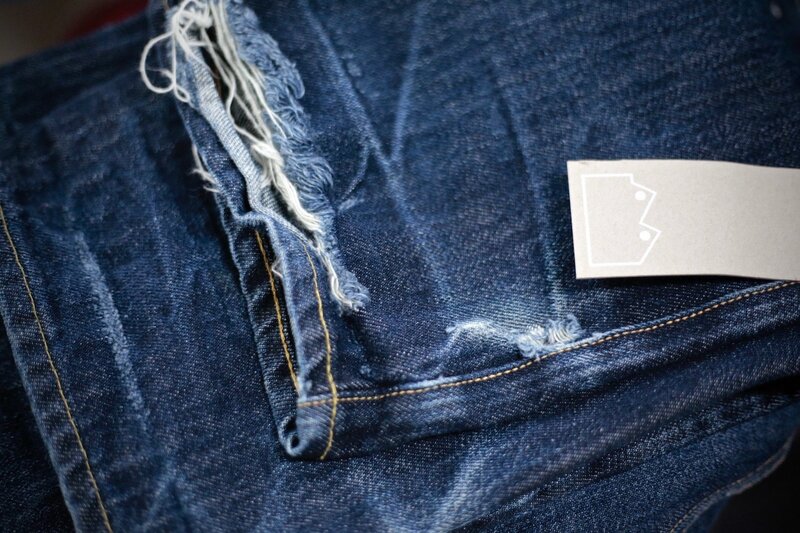 We’ve offered to fix their jeans for free if posted back to us, or to reimburse them to have them repaired locally. – As for the belt loops, they can be changed, but the way to do so would result in less strong loops, and wouldn’t look as nice. The loops are sewn into the waistband, hence the issue. We do take the feedback on board that maybe we should move them further apart. Could we see a picture of you wearing the jeans at some point? Sure Hugh, I’m planning one – but after they’ve been worn in a bit. Simon, what do you think of Blackhorse Lane’s ecru/cream denim (and of that colour of denim generally)? I like it but am unsure of its versatility. Thanks. Thanks! Would you wear them with sport coats, say as a casual alternative to your cav twills? Hi Simon, my wife is due a new pair of jeans. I can see BHL have a women’s pair which my wife said look quite flattering based on their website pics. Do you know any women that have them, and how they’re getting on? Richard, definitely let us know any questions you have about the women’s N5. We’re also about to launch a second style, the WC2 medium rise, regular straight, in a non-stretch raw denim. Thank you kindly for your response BHL. I’ll call the shop tomorrow. Thanks for another great and detailed review, Simon. Just got back from BHL and am now a full convert. I’ve been an Albam fan over the past few years since reading the post on here. Struggled with them in last year or so and have seen a steep decline in both the product and service. They have been out of stock of their basic jean for months which resulted in me finally deciding to try out BHL. Delighted I did, met Han and the team, who went through their product in detail and I loved walking through their workshop too. Historically I bought the regular Albam Jean and then had it tapered (slim was wayyyy to narrow). I am a cyclist, so tall, slim with big thighs and calf’s with skinny ankles and the raw E8 fit perfectly. I will be going back shortly to buy the E5’s for a slightly more relaxed/casual jean. Hope that helps other readers and highly recommend a visit to the factory store. I wonder if the Drakes No3 is made with the same high standard as the own brand? I am looking for a pair of jeans for tailoring (like a tweed sport coat) and want something for roomy tighs but is tapered below the knees. Got any recommendations for well designed jeans or a selection of many cuts? Seems the only thing people talk about when it comes to good jeans is the denim. I saw some lovely RTW jeans by Richard Anderson. They cost £450.00 which to me is really expensive for jeans. Their website says selvage Japanese denim, that’s it, no more info. I just don’t get the price when you can get Japanese selvage jeans for a lot less. 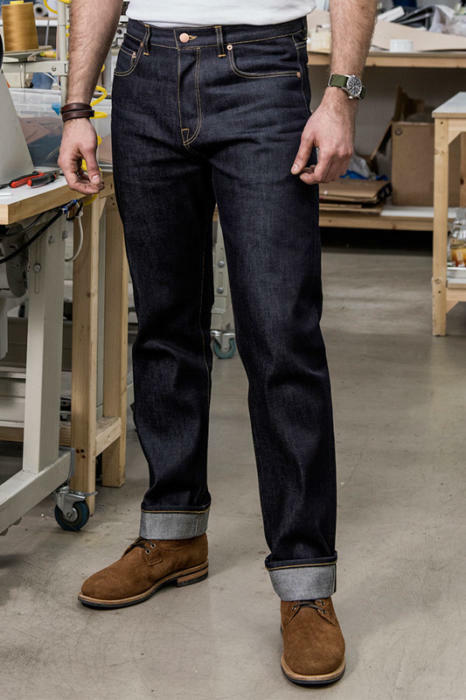 I’m a fan of jeans but I do often think that the whole japanese denim thing is a bit of a fad especially as denim from other countries is arguably just as good like US denim from Cone Mills.